Delhi-based truck aggregator TruckMandi is going through a churn with co-founder Anurag Jain quitting, even as the startup tries to rejig its business model. "The current industry needs an overhaul, where more product and technology is required. From an operations-tech company we are transitioning to a tech product, rule-based company," said Ankit Singh, co-founder, Truck Mandi. "It will help us scale faster in four major cities by this quarter and all across the country by the end of the year." TruckMandi, run by Fixinnov Technology Pvt Ltd, connects logistics services providers with customers for inter-city trucking services. It was founded in October 2014 by former Snapdeal executives Ankit Singh and Anurag Jain, along with former TCS executive Nishant Singh Jadon. In an email reply to Techcircle.in, Singh said, "Unfortunately, Anurag wants to pursue other interests. While we are sad that he is leaving us, we wish him all the best in his future endeavours." Meanwhile Jadon has also taken a month's break from the company. "Jadon will be joining us back in May," said Singh. Repeated attempts by TechCircle.in to contact Jain were unsuccessful. His LinkedIn update says he is "looking for some new adventure". When contacted, Jadon declined to comment and only said that the company's operations were being restructured. The startup now plans to put technology in the forefront of its business. It has shut down its customer care centre and will only entertain bookings via the app. "We won't partner with clients who are not willing to adopt technology," he added. From just being a booking platform for trucks, the startup now wants to provide additional services to vendors and truckers with the help of technology. Singh says that its current model is not scalable and TruckMandi is now building a model where "scalability is possible and is quicker too". The startup plans to tie up with petrol pumps, dhabas (restaurants located on highways and frequented by truckdrivers) and bring them on board with the help of technology to provide inclusive growth of the road transport ecosystem. The startup is now focusing on reducing the number of credit clients and is looking to partner with corporate clients. It has also decided to put on hold its plan to go after SMEs. Singh said that TruckMandi has encountered a lot of payment problems with SMEs. "Also, the transaction size is smaller for SMEs. We are looking for clients who are more organised," he said. However, angel investor Ajeet Khurana believes that it is not a smart strategy to ignore the SMEs. "While the pain points are less as compared to SMEs and there are no payment problems, the challenge with bigger companies is that they already have a system in place with robust tie-ups where they get better rates," said Khurana. "It might look like a capital-efficient business in the short term, but invariably the value you will create will be less." In 2015, TruckMandi had raised under $2 million (Rs 13.3 crore) in pre-Series A funding from JustEat India founder Ritesh Dwivedy and other investors. TruckMandi had started off as an online platform where transporters could bid for trips, with the startup charging a commission on every booking. The company counts Jindal Stainless Steel, Fedders Lloyd, Bonn Biscuits, Pushp India Pvt Ltd, DHL Supply Chain and A-One Containers amongst others as its clients. It currently operates in Delhi-NCR, Ludhiana, Haridwar, Ambala and Chandigarh. In the past two years, a number of startups have entered the road transport space, trying to bring changes in an industry notorious for the lack of transparency in deals, arbitrary rates, all-cash transactions and delayed deliveries. 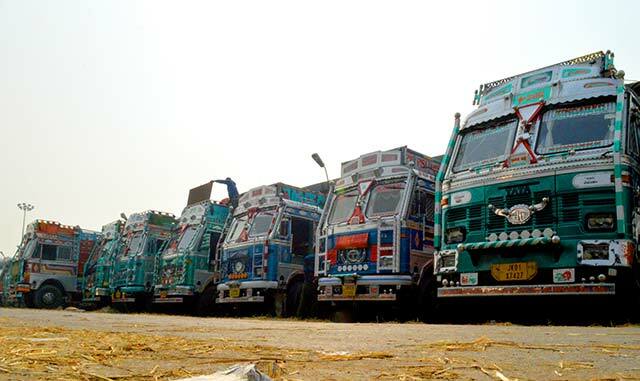 Online truck aggregators such as TruckSuvidha, Porter, BlackBuck, GoGo Truck, FreightBazaar, Moovo, Turant Delivery and CargoExchange have been trying to bridge the gap among companies, warehouses, transporters and truck drivers to ensure on-time deliveries and optimum use of fleet capacity. "The promise is to bring down the prices for the end users while increasing the income for the provider. Those who will be able to crack this will win," said People Group CEO Anupam Mittal, who has invested in logistics marketplace Porter.